February, March, November, December: daily 10am-12pm and 2pm-5pm. April to June and September, October: daily 10am-12pm and 2pm-6pm. July and August: daily 10am-7pm. Closed in January, 11 November, 25 and 31 December. 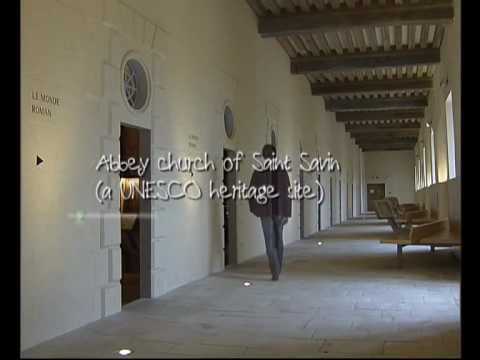 Guided tour of the Abbey of St Savin with a tour guide. Alternatively, an individualised scenographic tour of about 90 minutes, with a booklet, of the abbey and the monastic buildings. The Abbey became a UNESCO World Heritage Site in 1983, on account of its exceptional romanesque wall paintings. Come and discover this new presentation : fibreoptic lighting, wrought iron lamps and renovated stained glass windows. The monastic buildings of the 17thC house the scenographic tour: films, models, dioramas and multimedia areas provide an entertaining and interactive discovery of the site, putting the site and the paintings into a historic, religious and artistic context. This romanesque work of art should not be missed by anyone who wants to learn about the art of medieval Poitou. Also, visitors should explore the Valley of Frescoes, between St Savin and Saulgé, along the Gartempe river. This circuit links a number of different monuments decorated with murals. Artists of the past decorated chapels and chateaux, at the bidding of monks or the aristocracy, between the 11thC and 14thC. This tradition was rediscovered in the 19thC. Not far away is Montmorillon, known as the "Town of the Written Word and Book Crafts", and Chauvigny, with its medieval town and free-flying bird show. Since Roman times, the abbey church has contained one of the most vast and remarkable sets of murals created around 1100 AD. The monastic 17th century building welcomes you to the scenographic course which offers films, models, dioramas, and multi-media stations that ensure visitors an enjoyable and interactive discovery of the site and paintings in a progressive historic, religious and artistic context. Game and instructional booklet available for children. To see as well: the route of the Valley of the frescos , between Saint-Savin and Saulgé, along the Gartempe, which takes you to many monuments with painted murals. Many artists exerted their talents on the walls of the churches, vaults and castles, in answer to the orders of monks and lords between the 11th and 16th centuries. The tradition of mural decoration was again taken up during the 19th century. In close proximity: Montmorillon and its city of the Written Word and Book Crafts; Chauvigny, its medieval city and its high flying show.